Ten years ago, Morrisons was doing reasonably well. Under the leadership of Dutchman Marc Bolland it was wooing customers with a very simple and powerful strategy – offering good food at low prices. When he left to run Marks & Spencer, the supermarket industry was beginning to change and the company lost its way. It tried to entice more upmarket shoppers – people who would never think about setting foot in a Morrisons store – with fancy products at a time when Aldi and Lidl were taking its regular customers. The company also poured money into businesses such as children’s clothes company Kiddicare, convenience stores and posh home delivered food. It didn’t work. 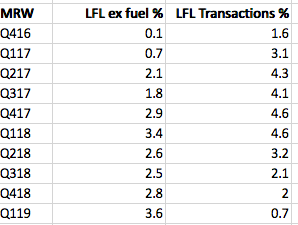 Essentially, Morrisons spent a lot of money and got very little, if anything, back for it. Profit margins and return on capital (ROCE) collapsed and the company ended up with lots of debt. Its share price tanked and its dividend was cut. This was a long way from the high levels of profitability and squeaky-clean balance sheets when Ken Morrison ran the company. Morrisons was not alone in being battered and bruised as the whole food retailing industry has had to readjust to a world of profit margins of 2-3% rather than 5-6% just a few years ago. Yet, there are encouraging signs that the company is on the right track again. Under the leadership of chief executive David Potts and chairman Andrew Higginson – both ex-Tesco – Morrisons is doing well. This has been reflected in a strong share price performance since the start of 2016, but there are grounds for thinking that its recovery might have further to go. Quality investors will not be interested in buying Morrisons shares. Its profit margins are too low and industry competition is too high to attract them. That said, I think Morrisons could have attractions for a different kind of investor – ones who want to tap into a growing source of dividend income. 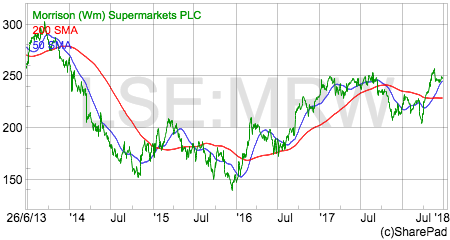 Despite the continued rise of the German discount supermarkets, Aldi and Lidl, Morrisons’ trading performance has been on an upwards trend for the last two and a half years. The good news is that this growth is being driven by selling more products to customers – an increase in the number of transactions – which is a sign that it has an attractive product and in-store offer. I’ve been doing the weekly family grocery shopping in Morrisons for the last couple of months having got fed up with Sainsbury’s pricing and am impressed with what I am seeing in the local stores I have visited. In short, I can see why like-for-like sales have been growing nicely. Based on my experience, the company is getting a lot of the basics right which other stores do not. By this I mean that the stores are clean, well-stocked and well laid out. The quality of the fresh produce is good – the fruit used to be awful and now seems a lot better – and the prices represent good value. The checkouts are usually fully staffed which means getting out of the store quickly is not a problem either. Having been a supermarket analyst in the City in the early 2000s, I can see the influence of the previous Tesco management at work in Morrisons today. This is particularly relevant with things such as checkout availability but above all else, the communication of value to customers. To me, it seems that Morrisons’ current management team have gone back to what used to work well and keeping things simple. In particular, it is using Morrisons’ strength as a major food producer as a source of competitive advantage by controlling food quality at a high level and controlling costs to keep prices for customers as low as possible. As Morrisons makes a lot of its own food in the UK it has been relatively well protected from imported food price inflation caused by the fall in the value of the pound over the last couple of years. Investment in more efficient food processing is also bringing its costs down. This gives it some advantage over the competition in both its supermarkets and wholesale businesses. One of the key attractions for shoppers in Morrisons over the last couple of years has been the growth in “The Best” range of premium products. From personal experience, I’d say these products are very good and that the plans to increase the range of them bodes well for keeping existing shoppers happy and perhaps attracting new ones. The current management team has done a very good job of stopping the rot, stabilising the ship and getting it moving forward again. I think that there is still more improvement to come from the existing store base – the current store refreshment project still has some way to go – but my positive view on Morrisons as a business is also based on the fact that its plans to grow sales and profits don’t require it to spend a lot of money. Not so long ago the default plan to grow sales and profits was to open lots of new stores. This required a lot of money to be spent on building them and fitting them out. It is a strategy that is doomed to fail in the UK where there are too many supermarkets chasing too few shoppers. Morrisons’ plan is to grow its profits by an extra £75m to £125m (£42m has been delivered already) by using its food processing expertise to become a significant wholesaler as well as growing its online business and paying down debt to reduce its interest bill. It has signed deals with McColl’s, Amazon and Sandpiper in the Channel Islands to supply them with Morrisons-branded food and is targeting £700m of sales by the end of 2018. The beauty of this business is that Morrisons taps into a source of revenue growth without having to take on all the overheads of running convenience stores and the risks of an online food delivery business – such as Amazon’s – that may not make significant profits. Morrisons has been a late entrant into the online grocery market but that in some ways is no bad thing given that few retailers have proven that they can make significant money from it. The company has taken a cautious approach to this market and has spent time on developing its in-store picking process and not rolling out the online delivery service too quickly. This strategy is showing promising signs of progress. If all goes well, then the extra revenues that come from it should not require lots of extra capital expenditure on new assets. This should see Morrisons improve its capital turnover and ROCE whilst continuing to produce lots of free cash flow. Free cash flow generation in recent years has been high but has mainly come from improvements in working capital – such as taking longer to pay suppliers – which are not sustainable. Going forward, free cash flow is going to have to come from higher profits based on low additional capex requirements. City analysts are currently forecasting just over £300m of free cash flow in 2018/19 rising to over £400m by 2020/21. Based on the forecasts in the table below it seems that the same set of analysts are expecting the bulk of this free cash flow to be used to pay down debt. This is no bad thing as it will reduce the company’s interest bill but a lot of this free cash flow could end up in shareholders’ pockets. The company paid a 4p special dividend in May this year and the outlook for dividend growth is good. Based on current forecasts, Morrisons’ shares are offering a free cash flow yield of 5.4% based on 2019 forecasts rising to 7.3% in 2021. 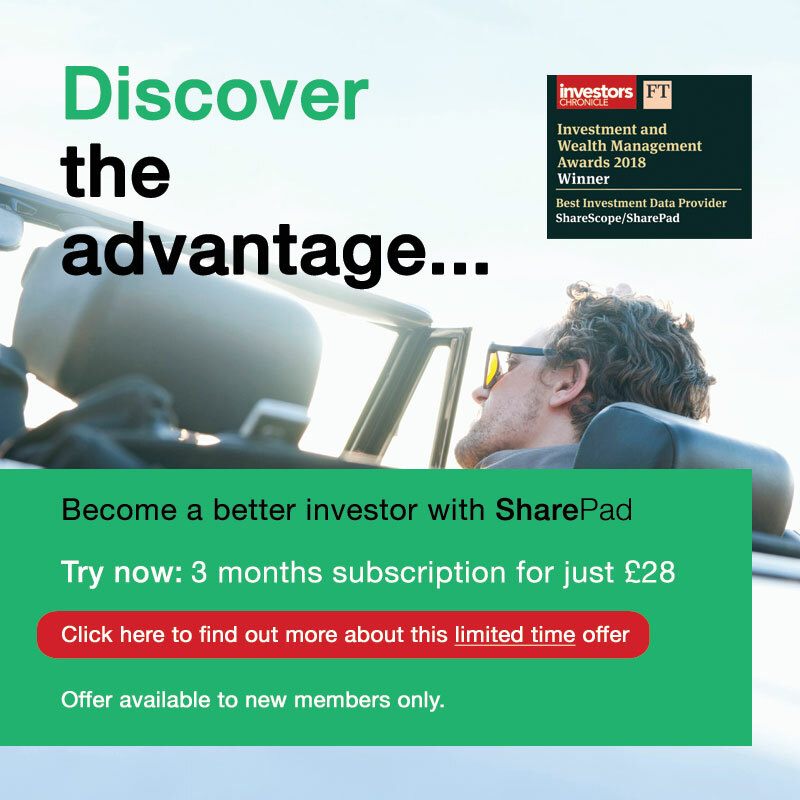 The dividend yield on the current share price of 248p is forecast to be 2.6% in 2019 rising to 3.7% in 2021 but this excludes any possible special dividends. 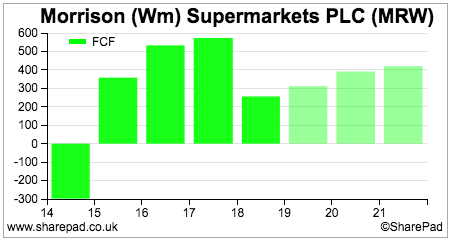 Morrisons shares may not be a bargain on a one year forecast rolling PE of 18.4 times but its free cash generation, the combination of further debt reduction and strong dividend growth could still see it warrant a place in defensive or income investors’ portfolios. 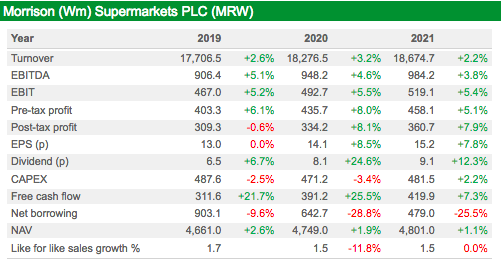 Morrisons in a changing UK supermarket sector – hunter or hunted? The proposed merger of Sainsbury’s and Asda may be seen as being negative for Morrisons’ future prospects. I don’t think that is necessarily the case. It has come about as a result of both Sainsbury’s and Asda’s weakening appeal with consumers. It remains to be seen whether the financial goals of the deal stack up and if a combined business can take customers from the competition. The merger will face considerable opposition from suppliers who feel they will get squeezed and potentially from the competition authorities who might claim that it reduces consumer choice. It is far from a done deal. If the deal does go ahead, it is likely to involve significant store disposals which may allow companies such as Morrisons to get its hands on some good stores in attractive locations. The deal is also unlikely to get in the way of Morrisons’ wholesale business or damage its competitive advantage in its own branded food products. I think there is a possibility that Morrisons could be bought by Amazon if the latter chooses to become bolder in selling food in the UK. Its purchase of Wholefoods in the USA has shown its appetite for buying existing companies to ramp up its business. Could the same happen in the UK? If it did, then given the existing relationship between the two companies and Morrisons’ food manufacturing assets a bid for Morrisons would seem the most obvious target in my view.